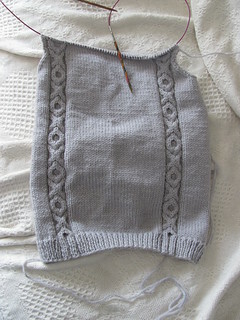 I’ve been plugging away on my Master Knitter vest and report. I have my outline for the report done, I just need to start actually writing it. And the vest is fairly well planned out and the front is more than halfway done. But I’m worrying about my knit stitch prior to my cable panel. I know I’m being more critical of my work than I probably need to be, but I can see some slight enlarging of that last knit stitch. 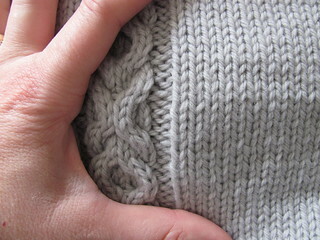 Can you see that the right hand knit stitch (before the cable panel) is a bit bigger? Or am I seeing things? 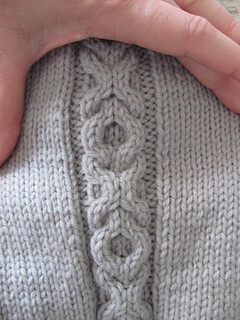 The left cable seems better – the right hand stitch before the panel isn’t as enlarged. We’ve been traveling quite a bit this month, so I haven’t had much knitting time. Plus we’re still working on the garage remodel, so that’s been limiting my knitting and report writing time as well. We’re at the spackling stage. Hopefully we’ll be painting soon! I wrote my book reviews, but I’m now thinking I need to add to them. As examples, I used the book reviews you see in magazines like Cast On and Interweave – and I wrote a very concise and brief review that’s about a paragraph or so. But in looking on the Ravelry group for pointers I came across a book review tips page, and it sounds like I should not have been quite as concise as I was. 🙂 So, I’ll revisit those as well and tweak what I have before sending the packet in. I should be able to send everything in sometime in January, I think. It’s actually been quite nice not having holiday knitting to have to deal with this year. But, of course, I have plenty of other stuff to deal with, so I’ve still been stressed. I’m very much looking forward to taking it easier and enjoying the holidays in the next few days. If I don’t post before Christmas, I hope you all have a lovely holiday. May your day(s) be filled with laughter, light, and love! I think you’re being too critical, it looks marvelous!